I can only imagine the excitement the three wise men must have felt upon the birth of the Christ child. However, I'm sure they did not get out of bed to "check on" the baby Jesus at 1:52 a.m. They also did not wake their parents up one minute later with news of His arrival. Why? Because they were WISE men. My children, on the other hand, are not so wise. This harrowing story from a University of Alabama student is the best I've seen at describing the experience of the Tuscaloosa tornado. It's been passed around a lot already but I wanted to share it here in case someone hasn't seen it yet. If you haven't, read it the entire way though -- it's worth it. Also, here's a frighteningly close perspective of the tornado recorded by another Tuscaloosa resident. 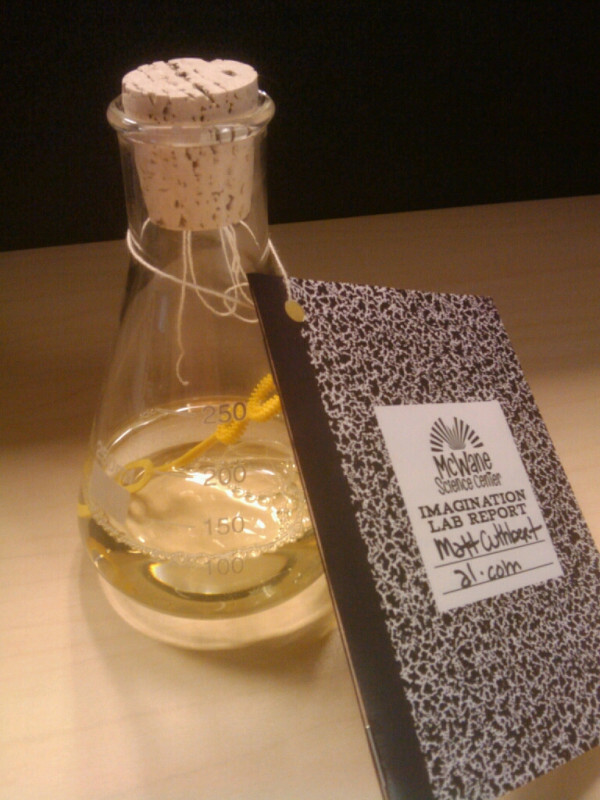 A guy in a lab coat delivered this to my office a few minutes ago. McWane Science Center continues their reputation for coolest press kits ever. Cuthbert girls and Reagan boys at the Zoo Run, originally uploaded by MCuthbert. Last year's Zoo Run was a big disappointment. Not because there was anything wrong with the race itself, but because for some reason the usual kids runs weren't included. Emily was heartbroken that she didn't get to participate. Thankfully the kids races were reinstated this year, so Emily and Kendall, along with their friends Tyler and Nolan, got to compete in the Chicken Cha-Cha and the Zebra Zip. It was funny watching the girls race -- they each had such different styles. Emily took it very seriously and booked it as fast as she could around her course. Kendall, on the other hand, wasn't sure which way to go -- or whether she wanted to run at all without her mom going along with her. Misty did the Run Wild for Orangutans 5K, accompanied by her friend and co-worker Shannon. They didn't earn medals like the kids did, but luckily neither of them cried. Here are more pictures from the Zoo races. Getting sprayed by the sprinkler, originally uploaded by MCuthbert. Warm weather is officially here as we broke out the sprinkler for the first time this year for the girls to play in the water. They had a ball getting sprayed, and Misty even joined in the fun. Here are more photos. Different teaching styles? Or different listening styles? At our church, about half way through the Sunday service, young children are dismissed to go to children's worship. Today, however, Emily said she wanted to stay in "big church" for the sermon from our preacher Bret Walters, while Kendall went to children's worship where our friends the Lydas were leading the lesson. Misty: What did you learn about in children's church, Kendall? Me: And, what did you learn from being in big church, Emily? Emily: That Mr. Bret used to work at a movie theater. Well, at least they were both paying attention -- sort of. Thanks to those who have expressed their concern over us here in Alabama. Our family is fine. 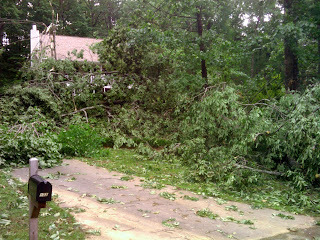 Our home suffered little damage beyond losing power for a couple days. After seeing what other people went though, I am immensely thankful of how minor our troubles were in comparison. This graphic is the best I've seen at showing just how widespread the Alabama tornadoes were last week. You can see one path of an EF-3 along I-459 that passed within half a mile of our house. That was the first one that came through around 5:00 Wednesday morning. The sirens woke us up just in time. We had our windows open and went to shut them since water was flying into the house, and the wind hitting us was scary. The news said that particular storm was moving east at 70mph, and it came and went really fast. Our neighborhood came through pretty well, but the neighborhood behind us got pretty torn up. 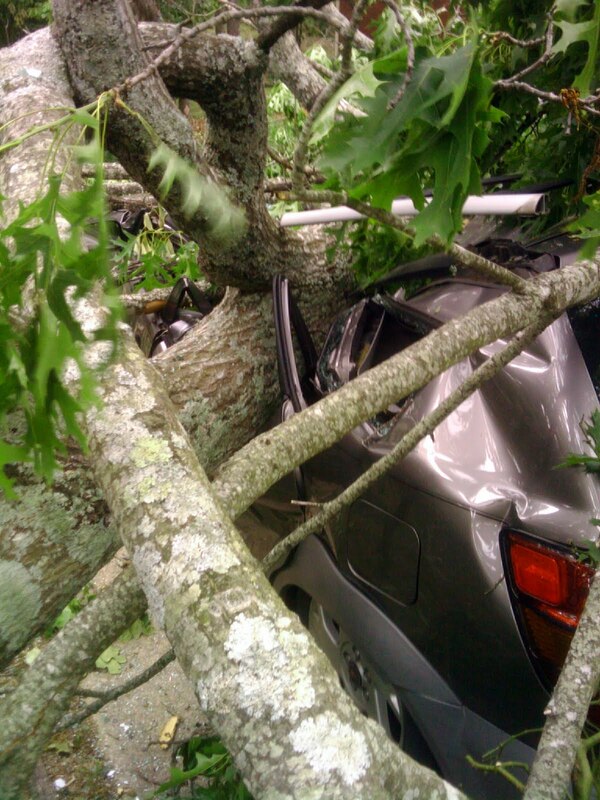 The pictures posted here show some of the "minor" damage that occurred there. We drove up to Cullman on Saturday to deliver batteries to Misty's family (there are no batteries to be found there, and none of the gas stations had opened yet -- in fact, we had a hard time finding batteries in Birmingham). All along the way up I-65, you could see paths where tornadoes had cut through and snapped power lines, bent light poles double, uprooted huge trees, and taken the roofs or sides off buildings. It smells like Christmas with all the broken pines. Misty's aunt and uncle actually saw the Cullman tornado pass by as they were headed to a storm shelter. Aunt Wanda remarked that it was odd that so many birds were flying around it. "Those aren't birds," Uncle Mike told her. "That's debris." Downtown Cullman was a mess. Lots of historic homes were destroyed. The National Guard was out on every corner. But the damage in Cullman is nothing compared to a lot of other places in the state. And everyone who's actually been to Tuscaloosa, Pratt City, Hackleburg, etc., says it's much worse in person than you can tell from the photos. Our church spent Sunday afternoon putting together relief packets of non-perishible food. We distributed 500 bags to Jacksonville, AL. Apparently there's a huge demand for ice everywhere -- folks are trying to keep some bit of their food chilled in coolers. People are also asking for stuff like bug spray, sunscreen, and dust masks. One of our bloggers on al.com (who writes a "good news" blog) is a journalism professor in Tuscaloosa. Her house was ripped up pretty badly, but not destroyed. Yesterday she found a body in her yard. Even beyond the cleanup and (eventual) rebuilding efforts, there are hundreds of people still unaccounted for. Emily finally got to go back to school today. Huntsville schools aren't opening until Thursday. The Huntsville Times (who themselves were operating without power and updating readers through Facebook and Twitter with their cell phones) has been listing businesses that are open since it's easier than listing the businesses that are closed. This is far from just a single-city disaster. Alabama has been decimated almost statewide. We're working to keep the information rolling out to people with extensive coverage on al.com. Our affiliate newspapers are churning out updates like crazy. Many residents are just getting their power back on (or still won't for another couple days), and they're just learning of how bad it is everywhere. Please keep those who have lost family members or their homes in your prayers. Emily: Oh. I thought it was oil. Misty: No, I wouldn't drink oil. Emily: I thought you were a robot. Misty: I wish we had a radio out here. That would be nice. Kendall: I wish we had a pet reindeer. Easter egg hunt, originally uploaded by MCuthbert. Though the girls (particularly Emily) were worried that the Easter Bunny would not visit our house while we were camping in the woods, he came through with Easter baskets waiting in the living room when we arrived home. After loading up on candy (particularly Kendall), we had fun with a series of egg hunts in the back yard. Here are more of our Easter pictures. Inside an old pipe at Tannehill State Park, originally uploaded by MCuthbert. Our family went camping this weekend at Tannehill State Park. It was a trip that almost didn't happen. We'd planned on going to Oak Mountain State Park, but we were turned away when we got there because their campgrounds were full. I never would have thought so many people went camping on Easter weekend! We called Tannehill, and thankfully they had plenty of room. It was a bit nerve-wracking trying to get the tent put together as darkness fell, and we were late getting a fire started for dinner, but by the next morning, everything was back to normal. We enjoyed hiking in the woods, wading through the stream in bare feet, exploring the old ironworks, playing at the playground, throwing rocks in the creek, and eating hobo packets and s'mores by the campfire. On our second night, we even saw a group of several deer bounding around in the woods just across the creek behind our tent. Encountering a snake a little while later was met with somewhat less enthusiasm though. Here are more photos from our camping trip. "Elisha Cuthbert" is currently a trending search term on Google. I hope that her new show "Happy Endings" will become a huge hit and make her a household name. That way people can quit mispronouncing and misspelling mine. Believe it or not, this subject is actually the focus of the most popular entry I've ever written on Impending Distractions. Thanks to a series of example mispellings of our shared last name, people who Google her incorrectly find my blog instead. During Haven's 10th anniversary party, I was interviewed by Daniel Horton for the first episode of his video podcast, Rocktt. It's billed as "Tech. Geek. North Alabama." In the interview, we talk about what the impetus was in opening Haven, the geek culture of Huntsville, the comic industry today vs. a decade ago, the idea of reading vs. collecting, digital distribution, and why Haven is still around after 10 years when so many other comic shops have closed. It was 10 years ago today that I opened Haven, a comic book store in Madison, Alabama, with my friend Josh. I spent the day at the shop, celebrating with Haven's customers, some of whom I've known for years, others whom I met for the first time. One of them even made this cake to commerate the occasion. I'm touched that Haven has been a special place for so many people, and I'm very proud that it's still going strong after 10 years. Thanks to Josh for keeping things going. I still miss it. IMG_5618_b, originally uploaded by MCuthbert. Emily chose to celebrate her birthday at Parties on the Move this year. She and her guests had a wild time bouncing on the inflatables. Afterward, her friend Abby got to stick around for a sleepover. Here's the collection of photos from Emily's party. 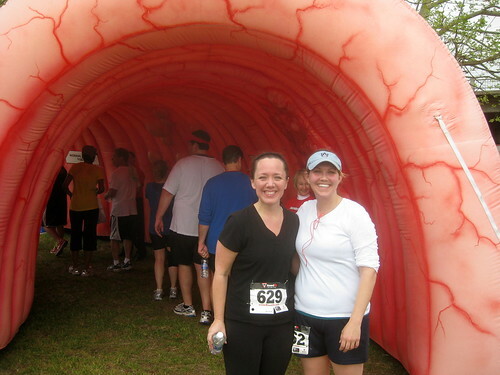 Giant inflatable colon, originally uploaded by MCuthbert. A year after achieving her goal of running a 5K race, Misty completed the Rumpshaker for the second time this morning. She's come a long way in the past year, and I'm so proud of her! Here are more pictures from the race. Super happy girls, originally uploaded by MCuthbert. In what turned out to be a unique birthday treat for Emily, I learned that Jennette McCurdy (who plays Sam on the Nick show "iCarly") was performing a free mini concert in Birmingham today and would be signing autographs for fans afterward. After work, we loaded up the girls and headed to The Shops at Grand River where we waited in a super-long line to by a copy of Jennette McCurdy's CD. At first we tried to keep our intentions a surprise, but with so many excited little girls there, it was impossible. It was so crowded that we had to watch the performance from behind the stage, and we had to hold the girls up for them to see. They didn't care though -- they had a fun time. After about half a dozen songs, we waited in an even longer line for autographs. However, we were really lucky in where we'd ended up standing, because the line stretched on a looong way behind us. Jennette's "handlers" made it very clear that, in order to get as many people through the line as possiblem, she wasn't able to pose for pictures or personalize photos. When Emily got to the table, though, our little girl worked her charm. "Hi, my name's Emily, and it's my birthday," she said as Jennette scribbled her autograph on an 8x10. "It's your birthday? !," Jennette replied. "Well, hang on a second." She then proceeded to draw Emily a cake with seven candles and wrote "Happy B-day!" on the photo. The girls were all smiles after that. They were so proud of their signed pictures. We capped off the evening with dinner at Red Robin and listened to the 2-song CD over and over again on the way home. Here are more pictures from the event. The video that Misty and I made for the girls after we took our 5-year-anniversary trip to Disney World without them just crossed the 100,000 view threshold on YouTube! If you've never seen it, here it is. It continues to get a few new comments every week. I'm glad so many people have enjoyed it. Morris Avenue alleyway, originally uploaded by MCuthbert. Our family didn't take a vacation for spring break this year, but I did schedule some time off work to pack in plenty of fun activities with the girls. We went to Railroad Park, McWane Science Center, the Peanut Depot, SoHo Square, Walk Park, and Star Lake. Then we finished up with a weekend vising my parents in Atlanta. Here are photos from our spring break adventures. Me: Girls, I'm going to get us some Chinese food for supper. Me: How did you know? I just told you. Kendall: Well, I thinked it. Kendall: I thinked it in my mind, because I'm a thinker. Happy birthday to Kendall, originally uploaded by MCuthbert. Kendall had wanted to have her birthday party at the park again this year, but poor weather conditions forced us to move the event to our house instead. 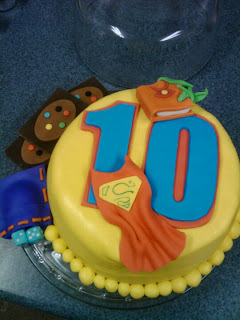 Here are pictures from her party and a few more from her actual birthday, when she and I went to the zoo. Wow. I think playing in the school band just became cool. I wonder if we should implement this idea at our church? 100_2901, originally uploaded by Wesley Higgins. 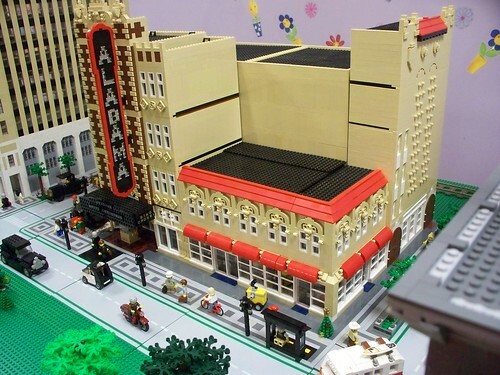 Check out this Lego construction of the Alabama Theatre! How cool is that?! It's going to be on display tonight at the Galleria Lego store. Here's a bunch more photos of the project from Wesley Higgins, the guy who constructed it. 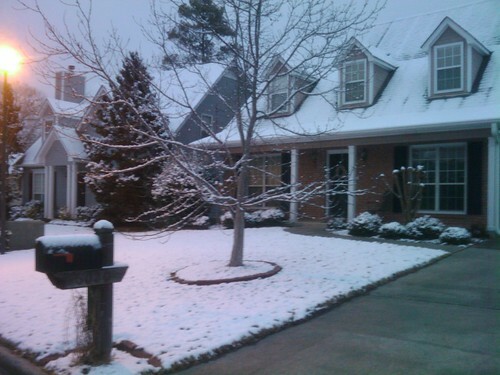 Another snowy morning in Alabama, originally uploaded by MCuthbert. Misty called me at work yesterday morning and frantically exclaimed, "I saw it! I saw the pig!" 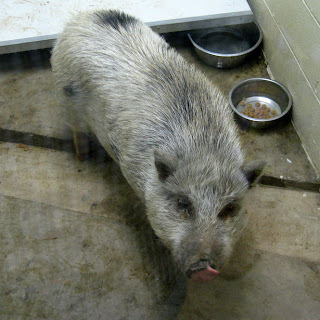 For the past couple days we've been hearing about a huge pig roaming around near our neighborhood. A substitute teacher from Emily's school even captured a picture of it as it passed by her home, and posted it on Facebook. So when Misty saw it trotting along Morgan Road as she drove Emily to school, she was thrilled to be part of the excitement. You'd have thought she'd spotted Bigfoot. On my way home that afternoon, I passed Hope Animal Clinic and saw posted on their marquee: Did you lose a pig? Obviously they'd captured it and put it in one of their kennels to keep it safe. Since the girls were all keyed up about the pig, I took them by the clinic to see it. The tales of its size were not exaggerated. This thing was huge. Either bravely or foolishly, I got into the room with the pig to take some pictures. His hair was stiff and bristly like a broom, and he was really heavy. He kept trying to bite my legs -- thank goodness I was wearing jeans. The girls thought he was gross (and I'm inclined to agree with them). While we were there, a local mail carrier stopped by and recognized the pig. She said she'd go let the owners know, guessing that they likely weren't even aware that it was loose. The whole thing was pretty funny. I turned the incident into a story on al.com. Kendall told us: "I want to invite everyone to my birthday. Except strangers. And mean people. And boys." I hope she'll make an exception at least for me. For Groundhog Day yesterday, I decided to have a little fun and write a silly article contrasting the Birmingham Zoo's groundhog with a local meterologist. I titled it: 7 reasons Birmingham Bill is a better weather forecaster than James Spann. Sometimes I can't believe the stuff I get away with at work. 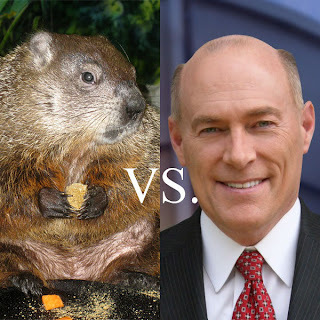 The story did really well though, and I was very pleased to find that Spann had a good sense of humor about it. The ABC 33/40 anchors even joked about it on the evening news. Exploring Sloss Furnaces, originally uploaded by MCuthbert. Misty's cousin Kristen and her son Traie visited us from Cullman this weekend, and we took them on a mini-tour of some of our favorite free family attractions in Birmingham. We started off with a trip to the Birmingham Museum of Art where the kids got to do a spinning paint project at Bart's Art Cart. Next we headed over to Railroad Park for a picnic lunch and some much-needed rolling in the grass down a hill. Our outing finished up at Sloss Furnaces, where the girls freaked out about ghosts they were sure they heard. Unfortunately, I forgot to bring along my camera, so I had to rely on my cell phone for pictures. Some of them turned out pretty well, though. In the evening before going out for barbecue at Jim 'N Nick's, we stopped by the Bessemer airport so the kids could walk onto the runway and look at the planes. While we were out there, three men came up to us and one of them asked if the kids would like to see the inside of a plane. He unlocked his plane and let each of them sit in the cockpit and wear a headset. Emily got nervous really quickly, certain that the plane was going to take off with her in it. But Kendall and Traie loved it. They both told me they wanted to be "airporters" when they grow up. Emily shared an idea with me last night on how we can save trees: "Why not cut down just one tree, make one big sheet of paper, and use the copy machine to make a million bajillion more?" Xerox should hire her to be their spokesperson. This is stupidity turned into brilliance. Epic music (Carl Orff's "O Fortuna") accompanies a Shakespearian-style reading of a badly spelled video game review.